Andrew: Right away we have another name for the database; Mabel Stoddard, whose father had a propensity for ‘just going out’ and didn’t consider Compo suitable. During the war, Mabel married an American who had two pips on his shoulders. Bob: It’s another nice opening, alright! ‘You were never really the warrior class’, snorts Foggy to Compo. ‘You’ve got something deeply civilian about those legs’. I could handle a full episode of this, and – now I think about it – I’m surprised that Roy Clarke never actually attempted a pure three-handed episode. Or did he? Does Full Steam Behind come close? The dialogue between the three main characters is so funny and believable that I can barely think of a sitcom that lends itself more readily to this stripped-down format. Andrew: Mabel Stoddard has got me thinking. As Compo reveals more and more women whom he claims to have loved (or at least lusted after) and lost, I’m starting to get the impression he has spent his entire life being rejected! It’s not overt, but Clarke imbues every one of his characters with this sort of depth and I’m loving it. Bob: Congratulations on being the first person ever to equate Last of the Summer Wine with Twin Peaks! Can you imagine Ivy’s reaction if Sherilyn Fenn turned up in Sid’s Café and started tying cherry stalks in knots with her tongue? Her feet wouldn’t touch the ground. 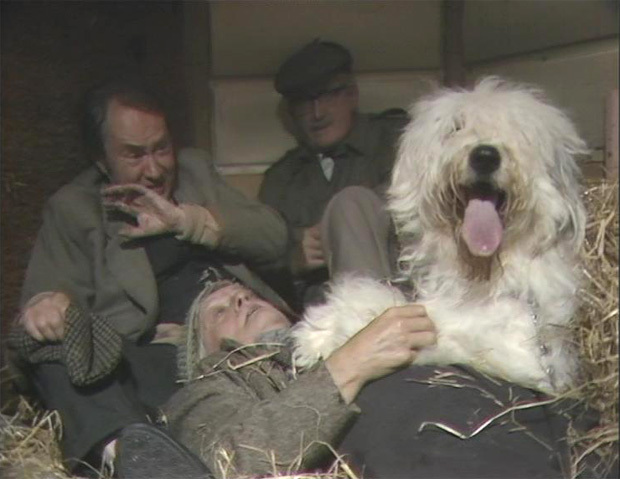 Compo’s reaction to the runaway poodle made me laugh out loud, too – ‘Ey up, someone’s made a right bog up of shearing that sheep!’. And I liked the exasperated dog-owner… ‘All I ever see it do is eat toffees, lick the wife and pee on my geraniums’. It’s an unwritten law in sitcom land that male dog-walkers must never actually like the hounds that they’re forced to drag around the streets. A rare Summer Wine saucy housewife! Andrew: With their struggle to carry the ‘self assembly modular high impact and stain resistant unit’ into the kitchen, Sid and Ivy prove once again that they should have had their own spin-off sitcom. I quite like the idea that in their show, Foggy, Clegg and Compo would be the guest stars who occasionally show up. In Sid and Ivy’s world an entire episode is devoted to trying to assemble that unit. Andrew: I love, love, LOVE the scenes in Sid’s Café between the trio and Wally. I think we learn more about Wally in this episode than ever before; his boyhood nicknames were Inky Batty and Little Laughing Walter Batty. This presumably all changed when Nora got hold of him. Wally had to make himself more attractive before Nora would take him on (like a fool, he did) and when asked what she looks for in a man, Gladwin delivers the deliciously deadpan, ‘total submission’. My very favourite revelation, however, is that Wally finds Foggy sexier than Nora! 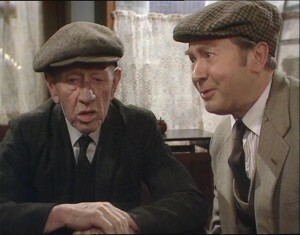 Bob: Wally Batty NEVER fails to light up this series, and Joe Gladwin’s performances are magnificent. He has truly tremendous comic timing, and I think Wally’s life story intrigues me more than any other character in Summer Wine. The others do indeed paint him as a happy-go-lucky young man whose entire persona was ground into submission by his marriage to Nora! By the time we meet him, he’s virtually in a state of permanent shellshock. I actually want to write Wally’s biography. Prospective titles include Howdo, Pigeon-Toed, and If The Cap Fits, but I’m open to other suggestions. Andrew: Surely it has to You Have To Laugh, accompanied by the most miserable picture we can find. Re: John Comer. I love the interplay between Sid and Ivy, but then I think John C was custom built for this stuff. I also love the first two series of I Didn’t Know You Cared by Peter Tinniswood. His role in that as Mr Brandon is a joy, especially sparking off Liz Smith and Robin Bailey, whose Uncle Mort was a work of dour genius. I bought them both on DVD last year and was surprised at how funny they still were, even if they had dated quite a lot in some ways. I identify LotSW starting to drop off in quality at the point where Sid dies. I think that’s the point where Clarke starts trying too hard with his characters to fill holes that really couldn’t be filled in the same way. I’d forgotten all about I Didn’t Know You Cared! I’ve got at least two series of that unwatched on the front room shelves. Must dig it out at some point. Sid gets ALL the funniest lines for the first ten years. And Wally is probably in second place! Clarke writes henpecked husbands magnificently. If you have series 1 and 2 you have enough. When Stephen Rea threw in the towel after series 2 it dropped off quite sharply. Cheers Jakob, I’m glad you’re here, keeping us in check with this stuff! Foggy looks much more like a Walter than an Oliver. So is it Oliver or Walter? Which is odd, because Americans don’t use pips as rank insignia. Unless he was an American serving in the British armed forces. Grew up in Holmfirth ‘72 to ‘92, so know a lot of the locations like the back of my hand. 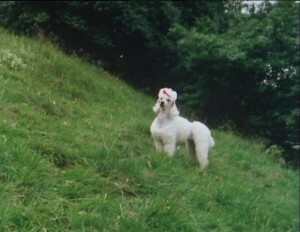 I saw the filming for the last few scenes of the Odd Dog Men in mid 1981. I was 9 but remember it vividly. The “substantial dwelling” was our family home at the time. Me and my brother were given 2 days off school to watch and planned to get in shot, but were quickly rounded up and positioned behind the cameras where we stayed for most of the next 2 very eventful days. Got to hang out with Stuart Fell at one point, who was stunt doubling for Bill Owen, not that I knew who Stuart Fell was back then. 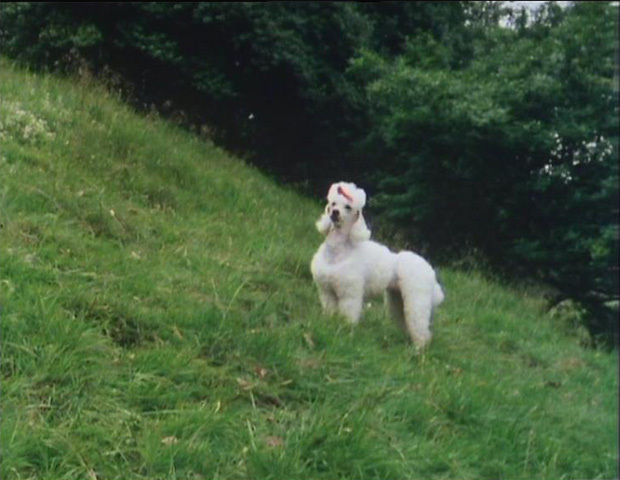 The sheep dog (confirmed at the time as one of the Dulux dogs) jumped over the wall at the top of the hill above our house and into a muddy field. My mum provided buckets of soapy water to wash the dog which was then blow dried for another take. The stretch of road at the top of the hill appeared a few times over the years, most notably towards the end of Isometrics and After (the shire horse sequence). We didn’t meet the regulars but Bill Owen stuck his tongue out and gave us a thumbs up, which I will always remember! When they were being chased by the dog Owen and Sallis could make a clean pair of heels, but Brian Wilde couldn’t manage much more than a brisk walking pace and was repeatedly overtaken by the dog, which was chasing its trainer up the road. It rained for most of the second day and so we spent a lot of time sheltering with the crew in the horse box which was parked on our drive. One of the production assistants (not entirely sure, but 75% tells me it was Rowena Painter; I seem to remember her being addressed as “Row”) was absolutely lovely and gave us autographed script front sheets as they were leaving at the end of day 2. Memories I have cherished ever since.